Global demand for U.S. securities is still strong, with China remaining the largest foreign holder of U.S. debt, according to the Treasury Department's latest report on foreign holdings. The U.S. government's top international creditor continued to add to its holdings, albeit modestly, according to the July Treasury International Capital report, which measures the flow of funds into and out of U.S. securities, including Treasuries, agency-backed securities, corporate debt and stocks, as well as banking capital flows. 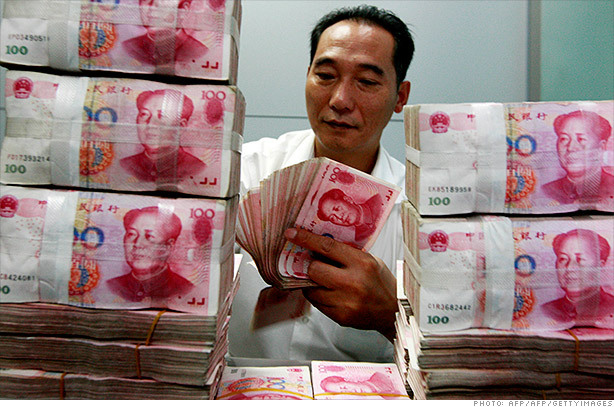 In July, Chinese investors increased their holdings by $2.6 billion to $1.15 trillion. But China cut its overall purchases of U.S. securities this year, paring back its total holdings by $2.3 billion since January. And over the past 12 months, China's purchases have declined by $165 billion. Japan, the second-largest holder of U.S. debt, upped its holdings by $7 billion to $1.12 trillion in July. Unlike China, Japan has added some $59 billion worth of U.S. securities to its holdings since the star to the year. And over the past 12 months, Japanese investors have poured $232 billion into U.S. assets. Overall, foreign investors bought nearly $74 billion worth of U.S. securities in July, compared with net purchases of just $16.7 billion in June. Private investors bought $59 billion, with public institutions taking in $14.7 billion. "With choppy financial markets and volatility in Europe, which were both widespread in July, private investors abroad purchased more Treasuries than any other asset class in July," said Wells Fargo economist Tim Quinlan in a note to clients. Against that worrisome backdrop, all three indexes manged to end July with mild gains. The Dow (INDU) saw a 1% uptick, the S&P 500 (SPX) posted a 1.3% increase and the Nasdaq (COMP) ended the month with a 0.15% rise. And while August was a painfully quiet month, stocks still ended the summer lull with a Bernanke-inspired bounce. Fast forward to last week's Federal Reserve announcement that it would buy $40 billion of mortgage-backed securities to help stimulate the economy. The news sparked a big rally on Wall Street as optimism pushed investors to riskier assets, such as stocks. Related: What exactly is the Fed buying? As investors made the shift, Treasury prices declined, lifting yields on U.S. government-backed debt. The 10-year yield, which hit a record low of 1.44% in May, is now hovering around 1.8%.